Whispering Loon offers 2 kayaks and canoe for added family fun! This two story home has 3 bedrooms and 2 bathrooms. Sleeping 10 comfortably. Whispering Loon is a beautiful barn style home, tastefully decorated throughout with many custom pieces. Offering three bedrooms and comfortably sleeping 10. The main floor Master features a custom made log canopy queen size bed. The main floor bath has a tub/shower combo. Bedroom two is located upstairs and offers two twin beds and a bunk bed. Bedroom three is also upstairs and features a full bed along with two twin beds. The shared upstairs bath features a shower. Whispering Loon will not disappoint. This property provides you with a feeling of seclusion where you can enjoy the fantastic water views and sunrises from the front porch or waterside cocktail deck. Truly a relaxing place to enjoy the scenery and take in the restful sounds of the lake. The minute you step foot foot on the property you will be delighted with your decision to choose Whispering Loon as your "Home-Away-From-Home". Located on the sunrise side of Fairbank Point Road. Hoping to host a large family reunion or gathering? Our Sunset Den property is located directly across the street and can comfortably sleep 6. View Rental Agreement for our Cancellation Policy. This home is located on the sunrise side of Fairbank Pt Rd. beds are made and waiting! One Canoe and 2 Kayaks will expand your ability to explore the waters of Drummond. Enjoy the water view from the front deck or the cocktail deck shore-side. Super happy with the accommodations! 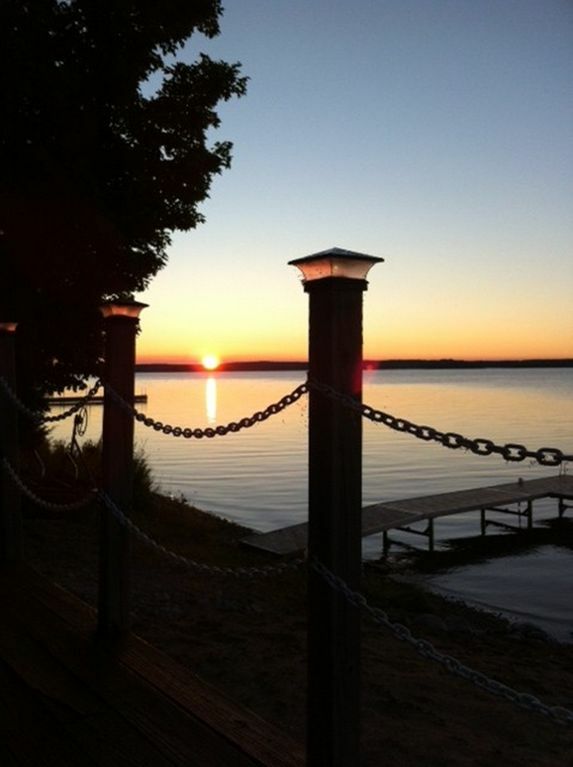 We are happy you enjoyed your stay at Whispering Loon and on Drummond! Better than the description, beautiful waterfront, lovely accommodations. We enjoyed every aspect of this property! We were three generations for part of the week, and all had a wonderful time. Plenty of room to spread out both inside and out. The kayaks and canoe were so much fun for the whole group. The way the dock is installed made it easy to limit the littlest children to the area bordered by the dock and shore. We also rented a pontoon one afternoon and found the dock perfect for loading and unloading passengers. We saw deer every day, loons in front of the house on the water and lots of other waterfowl, and also spotted an eagle. The house is very well equipped, the kitchen had everything we needed to cook, and having a nice laundry room was very handy. Beds were comfortable and all had lovely quilts. TV was limited, but honestly we didn't miss it a bit, the kiddos watched a DVD movie one evening, and the grandmas watched a couple programs on the somewhat rainy Friday. The neighborhood is very quiet, very little traffic on the road. The house is buffered from the neighbors a bit by light woods on both sides. Drummond Island has lots to explore, I'm sure we'll go back! We are so happy your three generation gathering had such a wonderful time on Drummond and at Whispering Loon! Thank you for taking the time to post such a fabulous and detailed review. We hope Drummond continues to be a place were you can build memories! Great place to stay. Clean, plenty of room and great location. Family loves the kayaks and canoe. This was our first time to Drummond Island and we had a great stay. The whispering loon home was impressive. Great location with incredible views. The house was well furnished, had plenty of space and a large deck. The dock was great to fish from and we used the Kayaks that came with the house and had a blast. I would definitely recommend this house if you are visiting Drummond. Thank you for your awesome review! We are so glad you and your family had a great time at Whispering Loon. We hope you consider Drummond Island Vacation Homes again for any future travel plans! Wonderful place to relax with amazing lake views! Drummond Island is a beautiful place. The house is nice and the lake is easily accessible. We enjoyed using the kayaks and canoes to see the lake. The kitchen is well stocked with anything you might need to cook. We especially liked the cool weather in late July! We are go glad you enjoyed your stay at Whispering Loon. The name says it all! Love hearing the call of the Loon while enjoying the view of the water from the deck. Hope you made some fantastic memories. Oops, so sorry the propane ran out on the grill. Re filled and ready for the next guest. So glad you were able to overcome the obstacle. Hope the rest of your stay was peaceful, relaxing and full of joy. 27 holes of Golf, one of the largest closed loop trail systems for off road - ATV / ORV exploration in the U.S. World Class kayaking, fantastic birding, hiking, biking. 17 Drummond Island shipwrecks and the Alvar. Drummond is 68% state owned, with 53 outlying Islands including, Harbor Island National Wildlife Refuge. Groomed snowmobile trails, cross country skiing, great fishing year around and sunsets unmatched anywhere! Drummond Island is comprised of 87,000 acres, 150 miles of rugged scenic shoreline, 133 square miles of forested lanscape, and 34 inland lakes. Within this diverse habitat, a number of rare species, land formations and plants can be found. Puddingstones, Maxton Plains, Alvar, Dry Non-acid Cliffs, Boreal forests, Prarie Smoke, Round-leaved Orchis, Calypso, the Yellow Rail, Leconte's Sparrow, the Common Loon, and the Hine's Emerald Dragonfly, just to name a few. Peak Season is Memorial Weekend thru Labor Day Weekend. Weekly Rentals ONLY for the months of JULY & AUGUST. A $250.00 deposit at time of booking and a signed Rental Agreement are needed to secure your reservation . Change over day is on Saturdays. Off season we require a 3 day minimum stay with a deposit of $250.00 due at time of booking and a signed Rental Agreement to secure your reservation. An additional cleaning fee of $75.00 will be assessed for all rentals less than a full week. We have a 60 Cancellation Policy, please see the Rental Agreement for details. Extra people require approval and are charged $15/day. This home sleeps 10 comfortably. Pet fee is $25.00 per pet for the duration of the stay. Please see the Rental Agreement for our pet policy. There is a two dog limit. VRBO doesn't account for multiple pets so the fee will need to be adjusted with multiple pets.